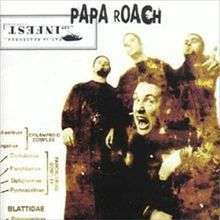 Infest is the second album by the rock band Papa Roach. It was released on April 25, 2000, and became the 20th highest-selling album of 2000 in the United States. The sound of the album is nu metal and rap metal. Many of the album songs contains rapping and hip hop influences. It was certified triple Platinum in the U.S. on July 18, 2001, and peaked at #5 on the Billboard 200 chart. This album earned the band a Grammy nomination for Best New Artist. Infest has sold more than 7 million copies worldwide with 3 million in U.S. and is their best-selling album to date. "Thrown Away" contains a softer, reggae-ish version of the song "Tightrope", which starts at about 4:57. Papa Roach was formed in 1993, as a funk rock and rap metal band. In February 1997, Papa Roach released their first album, Old Friends from Young Years, though the album failed to get the band a record deal. Papa Roach release new demos in 1998, and a demo in 1999 featuring the songs, "Last Resort", "Broken Home", "She Loves Me Not", "Infest", and "Dead Cell". Papa Roach toured in 1999; the band had an underground fan base in California. Due to the underground success of the 1999 demo heard by in house producers Tim & Bob, Papa Roach were signed to DreamWorks Records. Papa Roach went to the studio in late of 1999 to record Infest. Though many songs including "Last Resort", "Broken Home", "Revenge", and "Dead Cell" had already recorded, the band re-recorded them and made some changes to the lyrics. "Broken Home" deals with Jacoby Shaddix's broken relationship with his father. Papa Roach decided what songs would appear on the album, though the band only wrote 3 songs for the album, "Obsession", which would later renamed "Between Angels and Insects", "Blood Brothers", and "Never Enough". Papa Roach got Adam Goldstein to DJ for some tracks, including "Snakes". Papa Roach were finally done recording the album by early 2000. Infest was released in the United States and Canada on April 25, 2000 following radio play of "Last Resort". Infest debuted at No. 30 at the Billboard 200 albums chart. "Last Resort" became a massive hit throughout 2000 and peak at the No. 1 spot at the Billboard Modern Rock Tracks chart. With the massive mainstream success of "Last Resort", Infest reached No. 5 at the Billboard 200 albums chart and was certified Platinum by the RIAA. The follow up singles from Infest, "Broken Home", and "Between Angels and Insects", also charted. Following the success, Papa Roach went on several of tours. In 2000, the band performed at tours including Vans Warped Tour and the Anger Management Tour with Limp Bizkit and rap/hip hop acts such as Eminem, E-40, Xzibit, and Ludacris. In 2001, the band toured Ozzfest, where they performed main stage, on both the United States and United Kingdom tours. Papa Roach also played in some MTV shows during 2001. 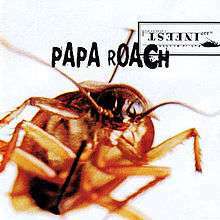 Infest was certified 3x platinum by the RIAA and is Papa Roach's best selling album to date. As of 2010, the album has sold over 8,000,000 copies worldwide, of which 3,000,000 for the U.S.
All tracks written by Papa Roach. Scratches on certain songs by DJ A.M. Mastered by Howie Weinberg at Masterdisk, N.Y.
"Revenge" contains an interpolation of Roger Webb's "Assignation"
"Blood Brothers" appeared in the 2000 video game Tony Hawk's Pro Skater 2, the 2001 movie The One (along with "Last Resort"), and the teaser trailer for the movie Evolution. In "Blood Brothers", the lyrics reference the Terminator's line "It's in your nature to destroy yourselves." "Never Enough" appeared in the 2001 racing video game Gran Turismo 3: A-Spec. "Last Resort" appeared in the second episode of Smallville and in an episode of Cold Case as well as other TV shows and movies. The 1999 demo version of "Last Resort" is also available as a downloadable track in the Rock Band games. "Dead Cell" appeared in the films The Skulls and Queen of the Damned, and on the soundtrack for the 2001 video game Shaun Palmer's Pro Snowboarder. Guitar and bass tab songbooks have been released for the album, both including the bonus track "Legacy". A heavier version of the song "Tightrope" was originally featured on the independent 1999 demo, Let 'Em Know. "Between Angels and Insects" was used by the WWF as the theme song for the WWF Invasion PPV. 1 2 "Review:Papa Roach - The Connection". Revolver (magazine). Retrieved 2012-11-10. 1 2 "Papa Roach Confirm New Album - Music News, Reviews, Interviews and Culture". Music Feeds. 2012-06-15. Retrieved 2012-11-16. ↑ Erlewine, Stephen Thomas. "Infest - Papa Roach". Allmusic. Retrieved July 13, 2006. ↑ Weingarten, Marc (July 21, 2000). "Infest: Music Review: Entertainment Weekly". Entertainment Weekly. Retrieved August 23, 2009. ↑ Christgau, Robert. "Robert Christgau: CG: papa roach". Robert Christgau. Retrieved February 18, 2009. ↑ Blashill, Pat (July 6, 2000). "Papa Roach: Infest: Music Review: Rolling Stone". Rolling Stone. Archived from the original on March 11, 2009. Retrieved March 6, 2012. ↑ Seward, Scott (June 2000). "Reviews". Spin. SPIN Media LLC. 16 (6): 158. ISSN 0886-3032. Retrieved 26 April 2013. ↑ "Papa Roach - Infest". ThePRP. Archived from the original on October 16, 2007. Retrieved May 22, 2009. ↑ "PAPA ROACH Celebrating 10th Anniversary Of DREAMWORKS RECORDS Signing". Blabbermouth.net. February 4, 2009. Retrieved April 7, 2014.